Clasp Lobster. Width 6 mm. Color Yellow. Our Diamonds Are 100% Natural And Are NEVER Treated Or CLARITY Enhanced.. we will make sure you are 100% satisfied with your. 3.5mm MOON CUT BEAD. Genuine 925 Sterling Silver,NOT Plated or Filled. Based in NYC, In the heart of the jewelry district. 22" - 13.5 GRAMS. We will try our best to reply as soon as possible, usually within 24 hours or less. Telio 18” Choker Chain Necklace Yellow Goldtone Necklace! This item is telio yellow gold tone choker style! With pendent! I do come shipping, please wait to pay, and let me know when your ready for your combined invoice! please pay within 5 days! Thanks for viewing, and have a great day! ITALY Sterling Silver BISMARK Chain Necklace-BISMARCK Anklet & Bracelet-7"~24"
New ListingAdjustable Rolo Oval Cable Chain Necklace Real Solid 14K Yellow Gold 16" 17" 18"
Clasp Type. Lobster Claw Clasp. Adjustable links at 16" 17" and 18". For a touch of style, look no further. A perfect addition to your wardrobe for pendants! Solid 1.5mm Adjustable Bead Ball Chain Necklace 925 Sterling Silver up to 24"
Dangle is pulled to shorten and lengthen. 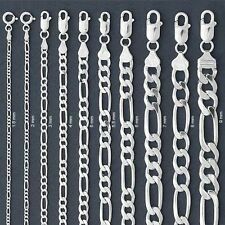 Very high quality, easy to use, dependable chain. Lobster Claw Clasp. Adjustable up to 24" from any size you like. 4.50 grams. Polished, Anti-Tarnish Rhodium Finish. 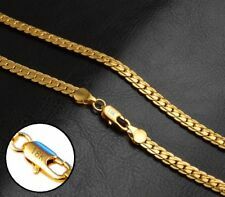 Chain has a 5mm spring ring clasp. Total item weight is a 0.75 gram and it has a mark 14K. This item was imported from Italy, only the clasp has been made and assembled in USA. This shiny, vintage Cuban link chain necklace is absolutely beautiful. This piece was made in the United States, by skilled American artisans out of 10kt yellow gold. This 18.0' long necklace is flexible, sturdy and strong, it will last for many years to come. mens/womens 4mm diamond cut rope chain 925 sterling silver 16/18/20/22/24/30"
Beautiful Solid 14k Yellow Gold Rope Chain Necklace! 16 Inches! 1.22 MM! Beautiful Solid 10k White Gold Foxtail Wheat Link Chain Necklace! 20 Inches! SOLID~ Sterling Silver 925 heavy BALL BEAD Necklace - 16" / 61 grams. Beautiful 10K Karat Yellow Gold Designer Franco Link Chain Necklace - Nice! Italy Sterling Silver .925 Lariat Style Chain Double Strand Necklace-16"
Gorgeous 10K Karat Solid Yellow Gold Cuban Link Chain - Beautiful!